European stocks extended a recent run of gains on Monday as a flurry of deal-making reports, including merger talks between German lenders Deutsche Bank and Commerzbank, spurred gains in the financial services sector. Shares in the two banks rose by more than 3 and 6 per cent respectively, lifting Europe’s banking sector by nearly 1 per cent and pulling the pan-European STOXX 600 index higher. Banks across Europe were boosted by the news, with Italian lenders Banco BPM and UBI Banca gaining about 3 per cent each. “If this works out, people are going to be looking at ... if this could be an example of what needs to be done to create further stability and less reliance on the central bank,” said Craig Erlam, senior market analyst at OANDA. The merger, however, will face fierce opposition from unions in Germany, as it could result in as many as 30,000 job cuts over the long term. 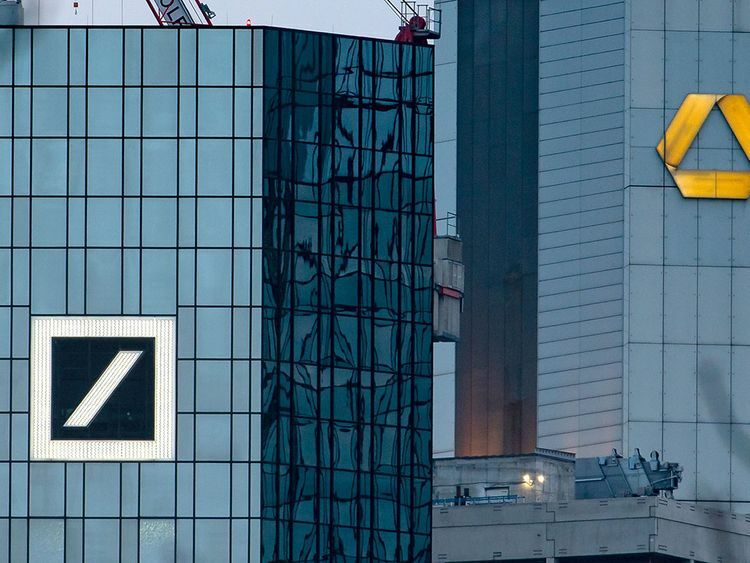 Also caught in the merger wave was German insurer Allianz, which Bloomberg reported was exploring combining its asset management business with DWS, mostly owned by Deutsche Bank. DWS shares jumped 9 per cent, touching their highest since May. European payments companies Worldline, Ingenico and Wirecard all rose between 1 per cent and 3 per cent on news that US fintech group Fidelity National Information Services had agreed to buy payment processor Worldpay for about $35 billion (Dh129 billion). That deal adds to a bumper few months for acquisitions in the fast-growing electronic payments sector which analysts say may be far from over. By 1019 GMT, the STOXX 600 was up 0.22 per cent, surpassing a five-month closing high it hit on Friday on the back of hopes of a less chaotic Brexit and progress in US-China trade talks. London’s FTSE 100 outperformed its euro-peers with a 0.7 per cent gain at the start of a week in which parliament is expected to vote for a third time on Prime Minister’s Theresa May’s Brexit plan after ruling out a near-term no-deal exit. Mounting speculation the US Federal Reserve will sound decidedly dovish at its policy meeting this week was also aiding global stock markets. The European Central Bank changed its own direction on policy this month, pushing out the timing of its first post-crisis rate hike until 2020 at the earliest and offering banks a new round of cheap loans to help revive the Eurozone economy. Basic and resources sector jumped 1.6 per cent, after Vale, the world’s top iron ore miner, announced further output cuts in Brazil, raising worries about tightening supply of the steelmaking ingredient and triggering a rally in Chinese futures. Germany’s automotive cable and wiring system specialist Leoni was the day’s big loser, sinking almost 20 per cent to its lowest in nearly nine years after the company announced job cuts and abandoned its 2019 profit target. Dutch bank ING Groep’s shares fell 2.7 per cent after Italy’s central bank identified “shortcomings” in its Anti-Money Laundering (AML) processes at its Italian unit.